← The photos are in…..
Two months on and I am still loving the Paleo lifestyle! I haven’t been 100% strict, allowing a few treats here and there (chocolate is one of them) but overall I am feeling amazing. I have made choices to be picky where I buy my produce and meats from & enjoying the positive results! For the first time in my “dieting” life I feel like I am NOT on a diet and in control and eating healthy. 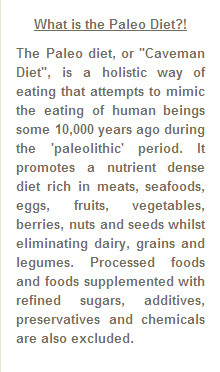 To say I have followed it 100% would be a big fat lie… I have had the occasional dairy treat or cupcake (paid for it afterwards mind you) – I enjoy the odd soy piccolo from time to time, enjoy some goats cheese now and then (preferably with beetroot and walnuts) but predominately I follow the paleo plan. I do not miss milk, bread, pasta or oats. I believe my diet is richer in calcium and fibre now with the variety of foods I eat than it was before. Leafy green vegetables, meats, eggs, coconut oil/milk, fruit, nuts, seeds…. heaven. Breakfast: two boiled eggs, salmon or ham, spinach salad with avocado and balsamic dressing, strawberries or berries on the side OR fresh fruit with coconut cream or coconut milk (light) topped with walnuts or brazil nuts. Lunch: Beef stew with vegetables; chicken/salad with avocado; fish curry with vegetables; frittata and salad; sardines and salad or with ratatouille; sashimi. Dinner: kangaroo w/sweet potato mash; broccoli, red capsicum; beef/chicken/lamb stews with potato/carrot/leeks; baked eggs with ham/pesto; beef stir fry with veggies, baked salmon with asparagus and pumpkin/carrot mash. Snacks: blueberries/almonds, coconut milk and fruit, almond meal protein balls, sesame seeds. Sounds great Don. Am thinking of trying this type of eating after I finish this round of 12 wbt. Glad you are feeling so well. Don’t think I could do it, but it really sounds like it’s working for you. Well done!